When working with Agile teams, we often hear about empowering the team, moving decisions down closer to the people that need to take actions, and having a more collaborative and servant leadership model. All of this creates a lot of confusion for managers that are on the front line of making this all work. This confusion creates a space where managers feel a certain frustration level as well because they know teams cannot just run amok and make any decision they please because they (i.e., the managers) are the ones accountable for certain things in the organization in areas where teams could be making decisions. From the team’s perspective, they need to compose with the polarity of becoming more self-organized while having a manager at the same time. So, what does this all mean for them? One thing we often forget when we talk about self-organization is that it does not happen through wishful thinking. I work with many teams that experience various levels of pain and frustration as they learn what that means. 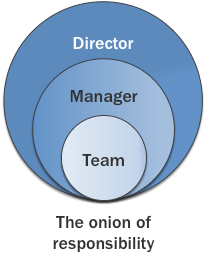 I like to illustrate self-organization using an onion of responsibility (see figure below). At the core level, the team needs to take care of the things that are within their power to handle. The problem is that, in many organizations, I see teams asking their managers to address situations for them and when I walk into their office, I can imagine in my mind’s eye all the golden monkeys they picked up from their employees. Using the onion of responsibility, my belief is that if teams handle enough of the issues they have control over, when they go make a request for help to their manager, they can show the effort they put in themselves. This reduces the amount of golden monkeys managers need to handle and, in turn, frees them up to address more complex issues on behalf of their teams. The big challenge here is letting team members know what they can handle and should be handling on their own. In other words, you need to define the sandbox the team can play in and make it explicit to them. A few months ago, I was working with a team that was experiencing frustration because their manager (who is also their Scrum Master) was less present for a couple of sprints. The team was frustrated because they felt they could not make certain decisions themselves. We did a workshop together using “Delegation Poker”, which is one of the tools we introduce in the Management 3.0 course to help us define a sandbox for the major pain points of the team. Using the seven levels of delegation allows managers to delegate some of their personal decision making authority to the team. There are some decisions in organizations that only managers are allowed to make, but they can decide how much (or how little) they want to involve their teams. Using this tool makes the boundaries clearer for both the manager and the team members. In the case of the team I spoke about earlier, everyone realized very quickly the real value of the workshop was not as much around identifying the right delegation levels but it was the conversations that it created between the manager and the team members around these topics. Empowering teams begins by letting them know your expectations as a manager around self-organization. This seems very simple, but not having this initial conversation paralyzes some teams because they do not feel they have permission to make certain decisions. The second step is making the sandbox clear around decision making. As I mentioned before, self-organization does not mean the team can do whatever they want. There are some decisions that managers are accountable for (such as financials) in the end and this does not necessarily change in an Agile context. In the Management 3.0 course, we explore how to empower teams through a game called “Delegation Poker”. This game is usually one of the key takeaways from participants, especially the ones coming from an organizational culture of command and control. There is usually a realization for many around how they can apply the tool in their real-life context.